Loggerhead Sea-turtles (Caretta caretta) have a distinctive, large head, for which they are named. These sea-turtles live near sandy beaches throughout temperate and subtropical regions, with migration patterns across the Atlantic, Pacific, and Indian Oceans as well as the Mediterranean and Black Sea. While there are no total population estimates, there are believed to be between 36,000 and 67,000 nesting Loggerhead females each year. As this sea-turtle population is experiencing decline, the species is considered and listed as vulnerable in the IUCN Red List. Loggerhead Sea-turtles can live for about 50 years or more, but are threatened by intentional and unintentional capturing, habitat pollution, and climate change. 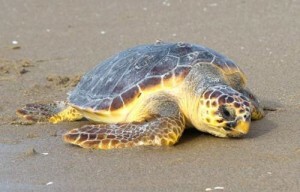 These sea-turtles and their eggs are taken for human consumption and commercial products. They are also accidentally captured in fishing gear. Marine pollution and climate change also threaten these turtles, as artificial lights can cause disorientation, turtles can ingest or become entangled in debris, and changes in temperature and climate impact nesting and egg hatching. Our objective is to establish, promote, and mentor local communities to protect breeding Loggerhead Sea-turtles visiting the beaches of Paloh in Indonesia and Akassa in Nigeria, and to safeguard their nesting sites and hatchlings from human and otherwise predators. We are convinced of the interest of local villager groups into conservation of the species through community led approaches.